No vacation to Southern California is complete until you've visited the world famous Venice Beach. 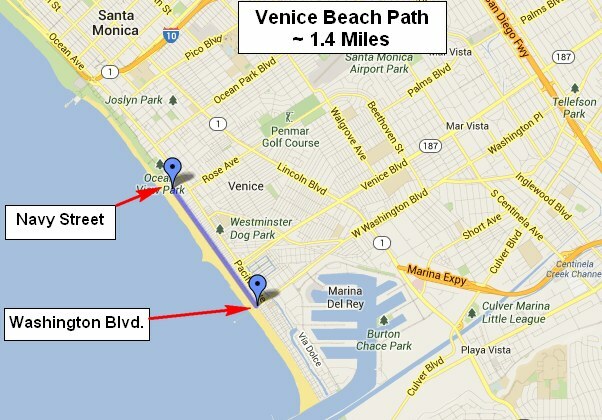 One of the best ways to see and experience Venice Beach is by riding or rollerblading on the Venice Beach Bike Path. The Venice Beach part of the bike path starts at about Navy Street on the North end and runs through to the Venice Pier at Washington Blvd. At Washington there are arrows on the ground indicating which direction that Peds should take and which direction Bikes should take but few people pay any attention. Venice at Navy St. - Venice Ocean Front Walk (Left). Beach Bike Path (Right). On one side of the bike path is the Ocean Front Boardwalk where hordes of people gravitate to ogle other people and shop for souvenirs. On the other side of the beach path is Venice Beach where hordes of people go to play in the sand and surf. Watch for people crossing back in forth without looking where they are going. It's best to ride slowly and enjoy the scenery. The path gets curvier through Venice and quite a bit of sand can end up on the path making it easy for bike tires to slip. Going slowly through these sections can help prevent crashing. Venice Beach tends to have bigger crowds than Santa Monica because of the vendors on Ocean Front Walk. If you decide to go on Ocean Front Walk, you must walk your bike or lock it up somewhere while you look around and shop and get something to eat at one of the many restaurants or eateries there. 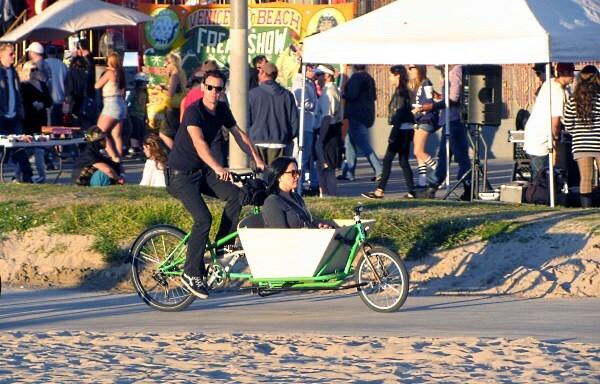 It can be a challenge to walk your bike through a weekend or holiday crush or people at Venice Boardwalk. The Venice Beach Bike Path area can be heavily congested with people on rollerblades, pushing baby strollers, riding bikes, riding skateboards, riding unidentified rolling and whirring objects, running, jogging, and walking. It can be a very carnival like party atmosphere. It can be very tricky to navigate through this area. Enjoy it. Bring your camera and prepare to get pictures of things you won't find anywhere else. The last tricky section is near the pier at Washington Blvd. Foot traffic, bike traffic, and automobile traffic can be quite heavy through here. You will be heading out onto Washington Blvd towards Marina Del Rey from here to continue on the bike path passing all of the restaurants. Slow down and watch out for cars trying to fight for parking spots in this area as well as pedestrians walking out into traffic. The ride will speed up down Washington Blvd towards the Marina. Santa Monica to Redondo Beach is about a 17 mile ride on a scenic stretch of smooth concrete beach path with a few bike lanes along the way. The communities listed below are popular hotspots for locals and tourists alike. These popular beach hot spots are top choices for event organizers to hold their events.